Sometimes faith and science converge to allow one to experience a special perception. In 1995 I had reached an all time low in both business and personal finance. I had extended everything to its max. In the previous 18 months we had accomplished two major construction projects. We had begun a very expensive rebuild of our home and at the same time we had also undertaken a complete "state of the art" remodel and upgrade to one of our retail businesses. These were two projects that were supposed to happen separately at different times, but by coincidence or by some strange cosmic force they were intertwined in such a way that they became linked and ran parallel. It is hard to explain how or why this happened, but it did and I will never understand the phenomenon. My wife and I had embarked on the planning of both projects several years earlier. Whenever we were about to move on either project something unexpected would come up. On the house, we ran into snags with the city concerning, construction requirements, structural setbacks and hearings for variances. On the business we ran into planning problems, zoning problems, city ordinance requirements, conditional use permit issues and other construction requirements. As a result of all of the "red-tape" construction on both projects ended up beginning almost simultaneously. 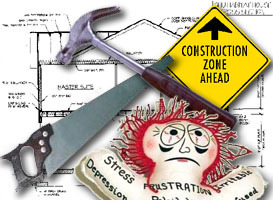 Anyone who has ever endured a major home remodel project will understand the emotional and physical strain that such an endeavor will put on a couple and a family. Doing the remodel on the business just added to that stress. Both projects ran into construction obstacles as well as the usual contractor problems. Inefficient scheduling and poor supervision sometimes set things back even more. Ultimately both projects arrived at a point of relative completion. I use the term "relative" because they both began to exhibit additional problems that drew them out even further. The business arrived at a point of construction completion, however new challenges quickly revealed themselves. Among the problems that suddenly loomed before me was the strange relationship, which developed between my landlord (a very large petroleum company) and my gross profits. There were several equations that began to reap a terrible toll on our financial survival. My home had reached a point of semi completion, however, there were so many "finish" items left to complete that we were still unable to move into the newly remodeled bedrooms and kitchen! Arguments with the contractor led nowhere and a strange mishap with our funding escrow also exacerbated the problem. As if all of that wasn't enough, the lease on a second business that I operated ended, and the landlord, a large shopping mall, refused to renew because of a desire to redevelop the property. 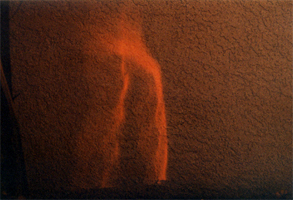 A photgraph of the image on the garden wall. I had begun to worry a great deal at this point; everything seemed to have taken a wrong turn. I spent many sleepless nights contemplating the future and what would be my next move. I really didn't quite know what to do. All of the options were very risky. Faith and my bizarre optimism were about the only things that I still had. So there I was -- 3am on a warm Long Beach night, sitting in the backyard, contemplating and meditating, when suddenly I saw it. What was it? I simply could not believe what I was seeing... There on the back wall of my garden just above the shrubs was this very distinctive glowing shape. It was about 12 inches high. It was not a circle as produced by a light bulb. 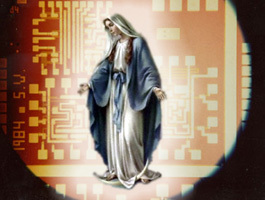 Instead it was a glowing silhouette of the Virgin Mary -- an apparition? Needless to say I was stunned... especially in the context of the moment. Was this a miracle? Was this some kind of sign? What was this? Was I hallucinating? I'm a believer but I'm not the type of person that sees stuff like this. This is the kind of thing you hear about in some poor rural village. What was I seeing? Was I going insane? 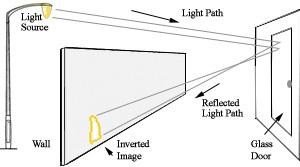 No, I wasn't hallucinating it was indeed a real light image, however I did find a scientific explanation for its appearance at this particular time and place. For some, this is where the story may lose its spiritual or miraculous nature, with the revelation of a logical explanation. It seems that the image was actually produced as a result of several things. The light source originated from a street lamp about 200 feet behind the wall. ...sometimes faith over-rules scientific explanation or perhaps they are actually intertwined. Maybe events would have taken the same course whether I saw the image or not, but I can't help but feel that perhaps the appearance of that image at that specific time in my life had a special affect on everything. By the way, everything did turn out ok and the image continued to appear every night. Over the following months, family and friends saw the image. Everyone pretty much agreed that it looked to him or her to be the silhouette of the Virgin Mary as well. My son said that it also looked like Darth Vader... which was true too. No matter how I looked at it though, I truly saw the silhouette of Mary. The image continued to appear for several months, but eventually the city replaced all of the street lamps with new lights and lenses... and the image stopped. Sometimes one simply needs to choose faith over cold science.